Corky Pugh, right, and George Mann of Auburn join in the celebration with young hunter Eddie Hackett, who bagged his first deer at Mann's farm. Citing the theory that there are only a few opportunities during one’s professional career to exit when the timing is right, M.N. “Corky” Pugh, Director of the Alabama Wildlife and Freshwater Fisheries Division, has seized upon one such opportunity and will retire, effective Dec. 1, 2011. Pugh, who succeeded longtime director and mentor Charles Kelley 12½ years ago, said he feels confident in the Alabama Department of Conservation and Natural Resources’ direction and wants to step aside and pursue other interests. “We have a Commissioner (N. Gunter Guy Jr.) and Assistant Commissioner (Curtis Jones) who have created a very stable organizational climate in which a transition can occur,” said Pugh, a native of Monroeville. “I wouldn’t entrust just anybody with that program and making the decision about leadership, but I trust Gunter. I’m confident he’ll make a good choice. And I trust him to make good decisions about the division’s future. A graduate of the University of South Alabama who later earned a Master’s Degree in public administration at Auburn, Montgomery, Pugh said his resumé looks like he couldn’t hold a job. After earning his undergraduate degree, Pugh became an investigator for the Mobile County District Attorney. After two years, he moved to Montgomery and worked as chief investigator for the State Attorney General’s Office for eight years. Pugh then served for four years as Assistant Conservation Commissioner under Commissioner Jim Martin during Gov. Guy Hunt’s term. He then went to the State Finance Department as Deputy Finance Director for 18 months before moving to the State Building Commission as Director for a year. During Pugh’s tenure, one of the Division’s major goals has been the recruitment and retention of anglers and hunters in the outdoors community. Pugh said, however, the recognition for that effort is not his. “The credit for these things belongs to the employees of the division, not to me,” he said. “I just drive the bus that gets them to the ballgame. Pugh feels the division can take pride in the ways it has adapted to the financial realities of the current economy, which have been highlighted in the division’s publication “Guiding Principles and Strategies” that is available at //www.outdooralabama.com/hunting/WFFGPS.pdf online. Of the items on Pugh’s to-do list that still need work, pay inequities for the Wildlife and Freshwater Fisheries (WFF) employees is one that he hopes will gain attention. “Were it not for the sheer commitment and initiative of our employees, we would not be operating at the level we’re operating at,” he said. “An opportunity to lead people like that is a rare thing indeed. The Association of Fish and Wildlife Agencies’ Education, Outreach and Diversity Committee, chaired by Pugh, has undertaken a massive conservation education initiative. Currently only seven percent of Alabamians hunt, but 89 percent of the population approves of hunting with one caveat – fair chase. “If you lose the element of fair chase, public approval drops to19 percent,” Pugh said. “The mainstream hunting community weighed in very clearly on the issue of fair chase with the passage of the prohibition on ‘canned hunts.’ I think the mainstream hunting and landowner communities weighed in very clearly by opposing hunting over bait. In fact, one of the most gratifying things in my career was watching the mainstream hunting community successfully defeat legalization of hunting over bait. Although Pugh will retire Dec. 1, he doesn’t plan to disappear from the Alabama outdoors community. “I plan to remain very active and devote the next several years of my life to ensuring that our hunting heritage is protected and preserved, and I plan to spend the next several years of my life ensuring that the common man is not stiff-armed out of the way by narrow special interests,” he said. “When you look at the demographics on our hunters, the vast, vast majority of them are hard-working, common folks. There’s a slippery slope that all fish and wildlife agencies face of constant pressure to over-regulate hunting and fishing or allocate the resource to the more avid, the more committed, the more affluent, more experienced hunters and anglers. But when you look at the demographics, you realize those hunters and anglers make up a small minority. Of course, Pugh said a few years down the road he’s going to kick back and just enjoy Alabama’s great outdoors. 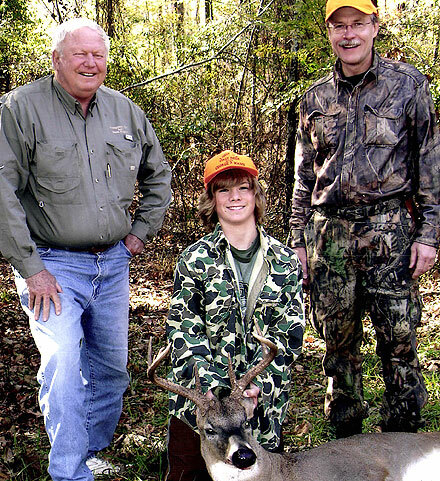 Corky Pugh, right, and George Mann of Auburn join in the celebration with young hunter Eddie Hackett, who bagged his first deer at Mann’s farm.